It's not every day, or even every decade, that an entirely new asset class is born. Yet, through a combination of computer science, cryptography, economics and network theory, digital assets have arrived and are proving that they are an asset class unlike any other. As they transform our global financial infrastructure and challenge modern monetary theory, we believe digital assets are one of the most exciting investment opportunities of the 21st century. New asset classes are rare and powerful because they offer a unique return stream that can diversify a portfolio. This might seem like a simple concept, but few investors truly appreciate the impact this can have on the return/risk profile of a portfolio, and subsequent wealth creation. As Cliff Asness, managing principal and chief investment officer of AQR Capital Management, has said, "Diversification is the one free lunch of investing, and when you see a free lunch, the only rational thing to do is eat." Consistent with modern portfolio theory, we generally subscribe to the notion that the optimal return/risk ratio for a portfolio can be found on the efficient frontier. But contrary to conventional wisdom, we think many of today's asset allocators are missing out on a free lunch. That's because digital assets represent a brand-new investment opportunity that is uncorrelated to other asset classes and investors are generally underallocated to this sector. It is our view that the optimal beta portfolio lies somewhere higher than what was previously believed to be the efficient frontier, and digital assets are the proverbial "missing piece of the puzzle." Digital currencies, like bitcoin, seek to fulfill the role of a decentralized global currency and store of value. Others, like zcash and monero, build upon bitcoin's role by offering privacy-enhancing features. Digital commodities, like ethereum, fuel decentralized applications that can execute condition-based transactions through the use of smart contracts, while assets like ethereum classic are a hybrid currency and commodity, combining the monetary attributes that have made bitcoin a digital store of value with the smart contract capabilities of ethereum. These are just a few examples of how digital assets are functioning today. Advancements in financial technologies and payment infrastructure. Regulatory shifts, altering financial industry economics and increasing the cost of compliance. Demographic shifts, driven by the next generation of investors entering their prime earning years and retirement obligations, financed primarily by equity and bond investments, coming due. Combining the growth opportunities that digital assets offer as a new technology and the store of-value characteristics that many of them possess as alternative currencies, digital assets may have the potential to provide both inflation protection and growth exposure concurrently. 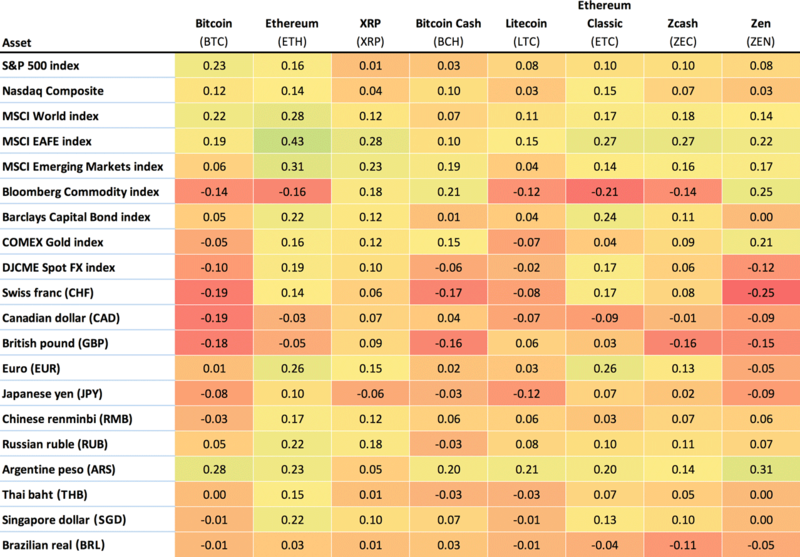 In Figure 1, we examine the relationship that some established digital assets have to traditional assets and each other through a correlation matrix constructed from rolling one-month returns over the last 1 1/2-plus years. Based on rolling one-month returns, Dec. 31, 2016 through Sept. 30, 2018. Sources: Bloomberg, CoinMarketCap.com. We selected the timeframe for our analysis because we believe it broadly constitutes the most complete historical dataset for the digital assets that we have chosen to analyze. For the sake of consistency and for comparison purposes, we will use this timeframe throughout the paper. The digital assets shown above have historically experienced significant intraday and long-term price swings. As the period during which these digital assets have been available for trading is limited, the correlations may not be meaningful when considering longer periods. From the previous tables, we can see that the correlations of rolling one-month returns range from negative to slightly positive, with an average of near zero. This provides evidence that digital assets can be considered a diversifying component in multiasset portfolios. Moreover, many digital assets are imperfectly correlated to one another, which indicates there may be diversification benefits within the asset class itself. To gain a deeper understanding of these benefits, we conducted a series of portfolio simulations to assess how an allocation to an equal-weighted mix of select digital assets might have impacted the return/risk profile of a portfolio composed of global equities and bonds (the global 60/40). Dec. 31, 2016 through Sept. 30, 2018. Sources: Bloomberg, CoinMarketCap.com. Annualized figures are based on 252 trading days. “Global 60/40” consists of a 60% allocation to the iShares MSCI ACWI and a 40% allocation to the Vanguard Total International Bond ETF. “Digital assets” consists of an equal-weighted mix of Bitcoin (BTC), Bitcoin Cash (BCH), Ethereum (ETH), Ethereum Classic (ETC), Litecoin (LTC), XRP (XRP), Zcash (ZEC) and Zen (ZEN). Component asset weights are held constant over the period. The Sharpe Ratio is calculated as the annualized excess return of the portfolio over the 3-month U.S. T-Bill divided by the standard deviation of excess returns. Ratio improvement is calculated by taking the Sharpe Ratio of the Global 60/40 + 1%/3%/5% Digital Assets Portfolios and dividing each by the Sharpe Ratio of the Global 60/40 Portfolio. Adding a 1% digital asset allocation increased the hypothetical simulated cumulative return by 449 basis points, without materially increasing volatility to improve risk-adjusted returns by 23%. Adding a 3% digital asset allocation increased the hypothetical simulated cumulative return by 1,391 basis points, without materially increasing volatility to improve risk-adjusted returns by 57%. Adding a 5% digital asset allocation increased the hypothetical simulated cumulative return by 2,397 basis points, without materially increasing volatility to improve risk-adjusted returns by 125%. Given what we know about modern portfolio theory, this is not all that surprising. Since digital assets are uncorrelated with traditional assets and imperfectly correlated with one another, they can be combined to build portfolios with higher risk-adjusted returns. Early investors in digital assets have long believed in their potential to capture a share of some of the largest markets in the world (for example, store of value), improve the efficiency of our global financial system, and create business models that democratize information and value in new ways. Investors also recognize that because of their highly unique set of properties, digital assets offer a distinct return stream, allowing them to play a diversifying role in their portfolios. 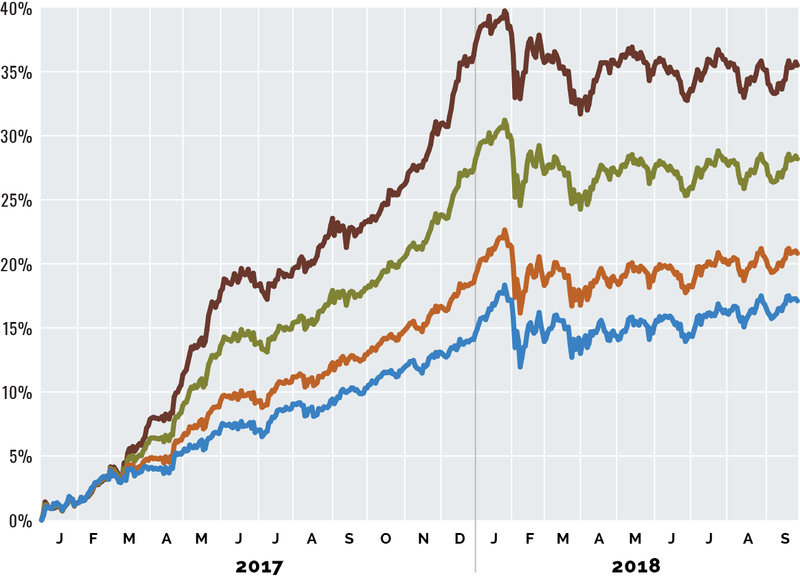 It's still early in the lifecycle of digital assets but there is a compelling case for investors to allocate some portion of their portfolios to this new asset class. A lot can happen over the next few years, but remember: Diversification is a free lunch and asset allocation is all about the long game. Matthew Beck is associate, product development and research at Grayscale Investments LLC, New York. This content represents the views of the author. It was submitted and edited under P&I guidelines but is not a product of P&I's editorial team.